Facebook page for the best kids’ deals! Totally not new and flashy but hello indigo bottoms! Girls and baby girls indigo leggings are discounted from $22.50 to $8.95 before the 15% off, Skinny French Terry cargos pants go from $35 to less than $15 with the sale, and skinny French Terry baby cargos go from $29.50 to $13. Do I have way too much Tea already? Yes. Can I resist indigo leggings for $7.50? No. Sigh. Patagonia and shoes! The entire site is included, which is a big deal because usually Tea sales are only good on Tea merchandise, not the other brands they carry. There are some crazy cute red Yosi Samra shoes that’ll be more than 50% off with this sale that I’m eyeing. And of course Tea’s Italy Collection. There are a surprising amount of things selling out (darn you, Eternal City Wrap dress! ), so if you have favorites it might be time to order, especially with free ship on any amount. Gymboree has a big picture on their site saying “Entire Store $14.99 and Under!” but then they have exceptions, so it’s not actually the entire store. Sigh. Still, most everything is at least 50% off, and their fancy dresses are 60% off with guaranteed delivery for Easter. This sale is good through midnight tonight (3/15) only. And of course my favorite section is to the left – Gymboree clearance, $2.99 and up. The free shipping code makes an even better place to get t-shirts, pants, and accessories. If you want to spend some money for a really fancy Easter outfit for your little boy or girl, Janie and Jack is your place. It’s all exquisitely done but the prices can sometimes make your eyeballs pop. So the 20% off sale and free ship is a great deal if you’re looking for a nice outfit (which will last forever), but don’t expect the prices to be as cheap as Gymboree, for example. This is a one-day sale so just good today, 3/15/16. See my post earlier this week for details about the Hanna deal – if you live near a Hanna store, take your old Hannas and go! Boden doesn’t have a specific promotion for kids right now, but their clearance section is now up to 70% off, so there are some good deals to be found in there. 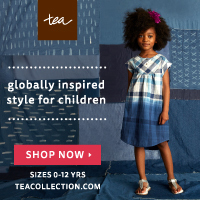 There isn’t a ton of selection left in terms of sizes, but if you have a bigger kid definitely check it out – I saw a lot of 10-11-12Y stuff in there. And if you want to do some shopping for yourself, they are having a 20% off sale on various women’s clothing! Amazon currently has spring wear on sale for boys, girls, and babies. The girls section has some cute dresses, both more fancy dresses for Easter and some casual stuff. I love the Jelly the Pug dresses that they’ve got, especially the Amanda Bright ‘N Blue dress, but I know Jelly the Pug isn’t for everyone – I think you have to see it on to know that it looks adorable instead of crazy with all the different patterns! They are more than 50% off right now (Amazon prices subject to change), so I’m not sure what they’re doing in the Up To 50% Off sale, but I’m not complaining. The boy’s attire in the sale is definitely more formal. If you need a button-down shirt or a suit, these are good deals, but don’t expect to find t-shirts here. Free shipping with Amazon Prime – if you don’t have Amazon Prime read my post on Prime, Family, Subscribe & Save, etc. and you can sign up for a free trial. Ok, that’s all I have time for right now. There are many more deals plus some amazing shoe deals, so I’ll do a part 2 of this post later. You can follow my blog here if you want to get a notification. Please note that I wrote about all of the brands that I like that have good sales, but some are affiliate links and some are regular links. I write about the clothes and shoes that I like and buy for my kids, so I aim to put whatever the best deals are, regardless of affiliate links or not. Thanks!